Marriages can go through all sorts of ups and downs as the years pass. This is expected to some degree, for it’s shared in most wedding vows: for better or worse, for richer or poorer, in sickness and in health. Knowing this helps, but when your marriage is going through a down time, it’s hard to find needed encouragement. If you’re not on guard you can find yourself looking for greener pastures. This is why we want to provide 4 encouragements to those who are discouraged in their marriage. You probably know all these, but if you’re the one who is discouraged you most likely need a reminder. Encouragement #1 – Hebrews 13 says, “Let marriage be held in honor among all, and let the marriage bed be undefiled, for God will judge the sexually immoral and adulterous. Keep your life free from love of money, and be content with what you have, for he has said, “I will never leave you nor forsake you.” Contentment is often associated with the pleasant place, but here God is calling us to be content because He has promised He will never leave us or forsake us. He will walk with us through the discouraging times helping us see the big picture, the eternal perspective of life. So if you are looking down, take some time to worship God for this truth. Put on your favorite worship CD. If you don’t have one may we recommend Matt Redman’s 10,000 Reasons album. One of our favorites is Never Once. Encouragement #2 – Philippians 4:6-7 says, “…do not be anxious about anything, but in everything by prayer and supplication with thanksgiving let your requests be made known to God. And the peace of God, which surpasses all understanding, will guard your hearts and your minds in Christ Jesus.” Oftentimes when we’re discouraged we allow our emotions to dictate and inform our thoughts, when that is the worst thing to do. Our emotions are not to be trusted, especially when we are being led into a downward spiral. How do we stop this runaway train? By crying out to God in desperate prayer. Let Him hear your heart. Let Him hear your fears. Let Him carry your unbelief, and He will listen. He loves it when, in our weakness we seek His strength, for this gives Him the glory He deserves. God has promised that He will give us peace when we do. If you have prayed and still lack peace–pray more. Pray until you feel the burden lift. The peace isn’t dependent on our circumstances changing. It comes when we learn to trust God in this place of uncertainty. He is our strong tower, and He longs for us to run to Him. David knew how to do this well. Read Psalm 4 for an example. 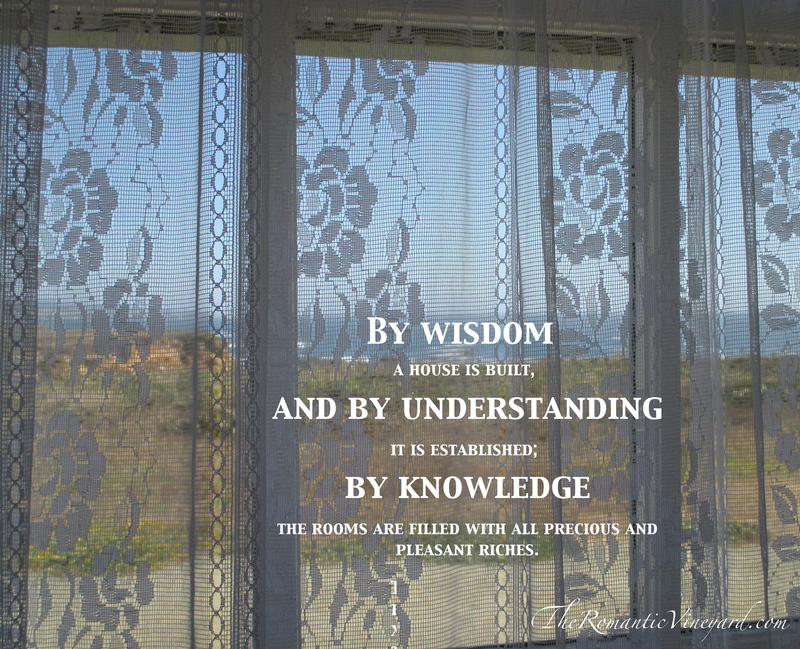 Encouragement #3 – Proverbs 24 says, “By wisdom a house is built, and by understanding it is established; by knowledge the rooms are filled with all precious and pleasant riches. A wise man is full of strength, and a man of knowledge enhances his might, for by wise guidance you can wage your war, and in abundance of counselors there is victory.” Seek help. There are times in all marriages where you simply can’t dig yourself out of the hole in which you find yourself. In times like these we must humble ourselves and seek the help of others. You’ve heard the saying, you can’t see the forest for the trees, well in marriage maybe you can’t see the answer because the problem looms too large in front of you? If your spouse won’t go with you for help, then we encourage you to go yourself. Change begins in your own heart, for it’s the only one over which you have control. Encouragement #4 – Psalm 9 says, “I will give thanks to the Lord with my whole heart; I will recount all of your wonderful deeds.” Take some time and recall all that the Lord has done for you in the past. Let this produce thanksgiving to God for what He was able to do then, and let this inform your future that God is good. Start a journal where you both list the things you can remember and if you cant remember ask God to help you. He will. What a testimony this journal will be not only to you in the years ahead, but also to those who are coming up behind you. It will stand and proclaim what God has done when death has already parted you in this life. What other ways can you think of to encourage those who are discouraged in their marriage? Won’t you take a minute to share your thoughts for their benefit in the comments? This entry was posted in Christian Marriage, Difficulty, Encouraging Your Spouse, Growing Strong Marriages, Troubled Marriage and tagged 4 Encouragements for the Discouraged Marriage, Hebrews 13, Hope for your Marriage, marriage, Philippians 4, Proverbs 24, Psalm 9. Bookmark the permalink. Discouragement in marriage can be a difficult hole to climb out of. Thanks for sharing these encouragements for hurting couples. Great truth here! Thanks, Scott. As you know anyone who has been married for more than a few months has experienced discouragement at one time or another. Sharing truth like this helps to get the word out that its a normal part of growing the marriage. What you do with it determines if its a positive or a negative.